Nice bourbon, not thin at 40%, but not a big boom. Floral. Sweet fruits, vanilla, glue, spicy oak and earth. Vanilla, milk chocolate, bergamot oil, waxy apple, ginger and pepper. 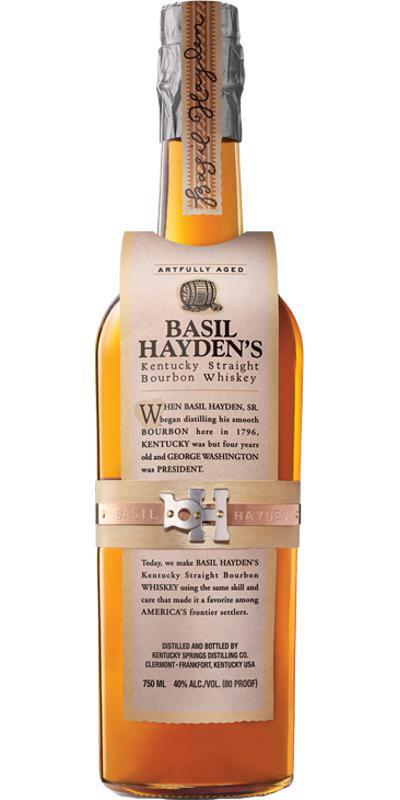 Basil Hayden was a Marylander who moved to Kentucky in the late 18th century. Like most settlers, he distilled his own whiskey, and like many Maryland transplants, he reportedly used more rye in his recipe than his neighbors.This whiskey, made by Jim Beam as part of its Small Batch Collection, pays tribute to Hayden by veering from its normal high-corn recipe with a refreshingly high-rye mash bill. Basil Hayden previously had an eight year age statement, but switched to a no age statement (NAS) labeling. Bottled at 80 proof, BH’s is the lightest of the Small Batch Collection whiskeys (the others being Knob Creek, Booker’s and Baker’s). sweet, some sweet glue, vanilla, a bit oaky, some spices. all in all just a sweet bourbon. not much complexity in this one. finish rather short, nothing special. This one almost has no notes of glue. Real good stuff for sipping - simple as that. First creamy and woody nose, quickly complemented by some cherries. Later, the wood is brighter and strange notes mid-earthy half-cardboard make a passage noticed. Then, flowers, violet, then finally milk chocolate. What evolution! A real trip. In the mouth, feel fluid, silky, fine, never watery despite the reduction. Very easy, dominated by vanilla, there are also not too overwhelming spices and a little milk chocolate. Final rather intense. Not a big bourbon, but a diversity in the aromas that transported me.